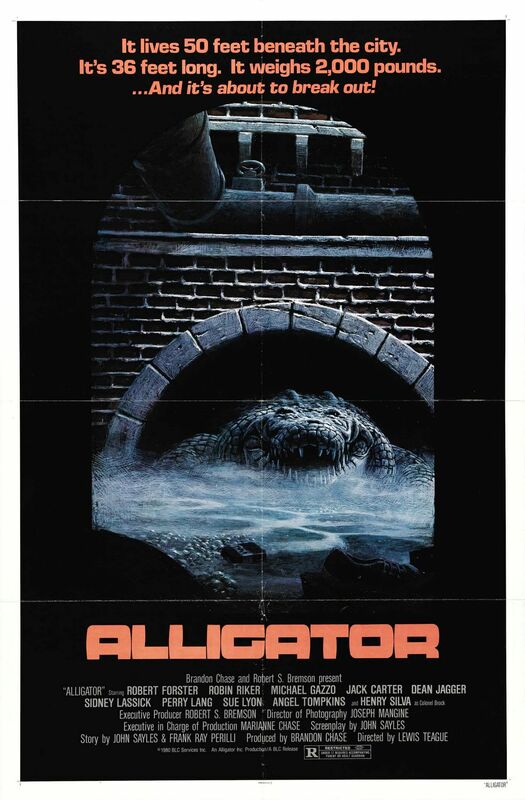 If you watch only one giant alligator movie this year, it should be 1980's ALLIGATOR. It's about as perfect a "nature gone amok"/giant monster movie as you can find. Sure, it follows the structure of JAWS pretty closely, but screenwriter John Sayles puts his own stamp on the material, making ALLIGATOR more than just a cheap imitation. One of the film's biggest assets is its assortment of memorable characters. For starters, we've got a great hero in Robert Forster's David, a rough around the edges homicide detective fighting the ghosts of his past and male pattern baldness, and not faring too well against either. Reptile expert Marisa (Robin Riker) is kind of a mess, too. She still lives at home with her mother, and her collection of pet snakes isn't exactly a turn-on for most guys. Then there's the fun supporting parts by character actors like Sydney Lassick (Cheswick in ONE FLEW OVER THE CUCKOO'S NEST) as an unscrupulous pet shop owner and perennial B-movie stalwart Henry Silva (MEGAFORCE, CHAINED HEAT, LUST IN THE DUST, and many more) as an arrogant big game hunter hoping to add the gator to his list of kills. For all the carnage, though, the overall vibe of ALLIGATOR is one of fun. Director Lewis Teague neither condescends to the material nor plays it too seriously. He knows his job is to make a cheap JAWS rip-off, but like screenwriter Sayles, he doesn't see any reason not to make this the best cheap JAWS rip-off he can. In the end it's a toss-up whether this one wears that dubious crown, or if it belongs to another Sayles-scripted quickie, Joe Dante's 1978 PIRANHA. 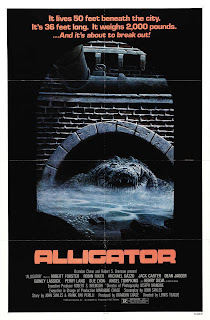 Either way, though, ALLIGATOR is well worth checking out, and since it doesn't have the benefit of a high profile remake like PIRANHA, I figure it's more deserving of a write-up here on the Cleveland Movie Blog.